Richard Linklater has lately evolved into one of my favorite filmmakers, alongside renowned auteurs such as Woody Allen, Stanley Kubrick, David Lynch, and Kathryn Bigelow. Back in the 90s, I did adore Linklater's inaugural efforts, "Slacker" and "Dazed and Confused," but then he kind of dropped off my film-geek radar until "School of Rock." Sure, I enjoyed the "Before Dawn" and "Before Dusk" movies, but "School of Rock" stood out as quirkier film fare, more aligned with his first two films. But the beauty of Linklater lies in his stark diversity; seemingly, no film of his has the same imprint, unlike, say, a Kubrick or a Lynch, films which are immediately identifiable by certain idiosyncratic elements. This could also be seen as a handicap, however, because if there are no features that distinguish Linklater from more generic film-crafters, then is his peculiar talent really that distinctive? But I maintain that yes, it is. Because first of all, there IS a Linklater trademark, but it's not readily tangible. It's something you have to think about after seeing a handful of his more notable films. The Linklater imprint is dialogue - lots of it. In many of Linklater's films, such as "Slacker," "Dazed," "Tape," and the "Before" triilogy, dialogue is its own character. It plays such a central role in his best films that you don't even notice that it eclipses the plot - that, indeed, dialogue, not plot, is what drives these films. Or, rather, dialogue IS the plot. In Linklater's latest film, "Before Midnight," his true masterpiece besides "Slacker," dialogue is nearly an oppressive presence. The film is so dense with dialogue that you feel heavy under its weight. But this is a positive oppressiveness, if you will allow me such a paradox. The dialogue is delighftul, but there is such a constant barrage of it, and some of it is so intense, that it leaves you dialogue-fatigued by the end. The loquaciousness of the characters is exhausting, if rewarding. The film, of course, is the third installment in the story of an American man, played by Ethan Hawke, and a French woman, played by Julie Delpy, who meet on a train in Vienna as young idealists. The pair spend one glorious night together, but then do not see each other again for ten years. The second film delves into their reunion a decade later. By the third film, the pair are married with children, and their relationship is envincing the wear and tear of the years. Or, rather, the long-standing union between a man and a woman is revealed in all its cursed complexity. The bulk of "Before Midnight" involves a fierce, drawn-out, circular argument between the couple. The conflict's contents are painfully realistic, and the argument is acted with uncomfortable verisimilitude. Couples who are seeing the movie together might erupt with nervous laughter in recognition of how true-to-life the argument is in terms of the topics covered (domestic issues ranging from childcare to gender roles, and also practical concerns such as jobs and relocating to another country), as well as how predictably the two sink into their pre-defined male and female roles. Indeed, the war between the sexes is brashly staged in "Before Midnight," as Ethan Hawke and Julie Delpy are unabashed in their unfettered portrayal of a man and a woman bemusedly navigating the waters of modern-day family life. It's a film that features such fidelity to reality in terms of authentic dialogue and acting, and that is so intimate and intense, you are drained by the end, and yet also invigorated. Drained because the script dialogue is so exacting, and invigorated because the dramatic expression of that script is so ferociously honest. And, I daresay, one feels rather validated by this movie, especially if part of a couple. 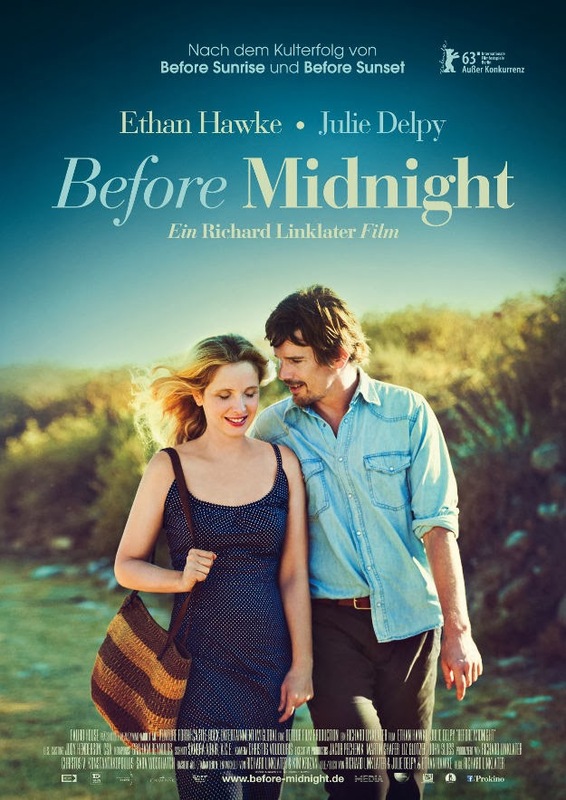 For coupledom can be convoluted, and "Before Midnight" seems to bask in this fact. "Before Midnight" should be mandatory viewing for film buffs and weary couples alike.